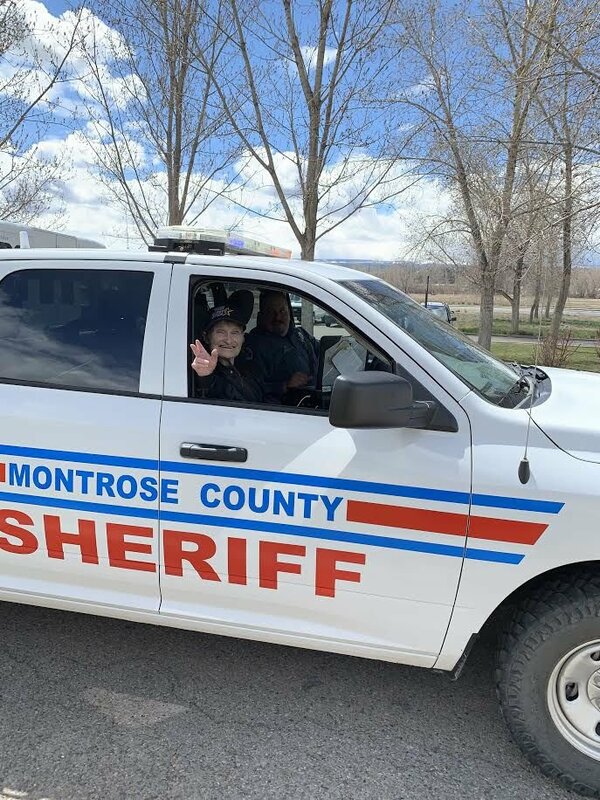 Nancy Moore is all smiles as she heads out to the road Thursday, with Deputy Dominic Lovato. Montrose County Sheriff’s Office Deputy Dominic Lovato hands Nancy Moore her “starter pack” for her day as an honorary deputy Thursday. Moore, a former law enforcement volunteer, was made deputy for a day as part of PACE’s One Simple Wish program. When Nancy Moore left the Los Angeles Sheriff’s Department, she did not leave her fondness for law enforcement behind. The longtime civilian volunteer carries her love of the field with her and, on Thursday, she got the chance to relive it. “I like it. This is what I used to do,” Moore said, as she prepared to be sworn in as an honorary Montrose County Sheriff’s Office deputy. 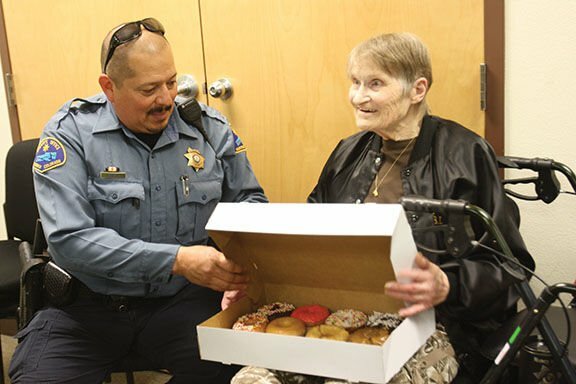 Sheriff Gene Lillard and Lt. Ty Cox worked with the Volunteers of America Senior CommUnity Care PACE’s One Simple Wish program to let Moore, 75, have another taste of the work she used to do. Thursday, she was treated to lunch, gifts with the MCSO’s insignia, and a ride-along with Deputy Dominic Lovato. When working in California, Moore took care of a variety of tasks, including greeting people entering the sheriff’s department and providing reports. She also conducted followup calls for incidents like domestic violence, fingerprinted children, and performed record-keeping tasks, staying with the department for about seven years. “I did everything,” she recalled Thursday, while chatting with her partner for the day, Lovato. Moore ultimately moved to Montrose to be closer to her son and his family. PACE — Program of All-inclusive Care for the Elderly — helps support Moore’s ability to remain in her home. Johnson said PACE staff members contacted a deputy once they knew of Moore’s wish, then met with MCSO staff to create the deputy for a day opportunity. “It’s a win-win for everybody, something she’s always wanted to do,” Lillard said. The One Simple Wish program accepts applications from seniors who are chronically ill or low-income, to make possible life-enhancing experiences. The wishes can be as simple as wanting to sit among puppies, to as adventurous as sky-diving or a hot air balloon ride. One man, who was near the end of his life, requested a celebration for his 65th wedding anniversary. “It’s a real honor to be able to help determine what some of their wishes are that they have not been able to fulfill,” Johnson said. PACE raises money for the One Simple Wish program through the Age Out Loud event, which also helps fund PACE Outdoor Adventure programs. Age Out Loud this year is May 10 at the Montrose Pavilion, featuring The Hazel Miller Band, with special guest Chris Daniels. Pre-concert, enjoy a silent auction, music by Donny Morales, cash bar and food truck fare from Blue Ribbon BBQ and Surfin’ Salmon. The pre-concert event begins at 5:30 p.m., with The Hazel Miller Band at 7 p.m.
Tickets: $25 for general admission; $30 for reserved. Service fee applies. Purchase at ageoutloud.voa.org. Businesses interested in sponsoring the event can contact Lori at 970-417-5670 or llenhart@voa.org.